Are your locks long and lustrous? Or do you keep them trimmed with military precision? Either way, you need a good quality hair brush to banish tangles and keep your hair shiny and healthy. Mason Pearson have been making luxurious rubber cushion hairbrushes since the 19th century, and each brush is still hand made to ensure the qualities that made the original models classics remain in their modern range. The rubber cushion pad beneath the bristles of each brush allows for effective brushing which gently massages your scalp, increasing blood flow to the roots. Each handle is hand-polished to ensure edges are smooth and the brush is a pleasure to hold. 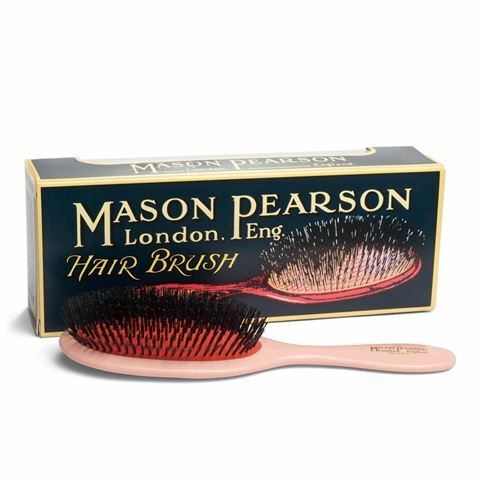 So whether you follow your grandmother's advice and brush your hair one hundred times before bed each night, or just give it a few quick swipes on your way out the door, with a quality Mason Pearson brush your crowning glory will always be looking – and feeling – its best! Tufts made from pure boar bristle. Six rings of bristle tufts. Boar bristle tufts are designed for fine to normal hair. Head Dimensions: 6.4 x 11cm.